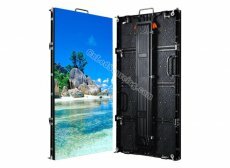 Gearing with good quality SMD1921 waterproof LED lamps and high refresh rate driver IC with more than1,920Hz (up to 3840Hz-optional), these compact P3.91 outdoor rental LED panels are perfectly suited for both indoor and outdoor stage and rental applications requiring extremely clear image details at closest viewing distances. The best price above is based on one cabinet size of 500mm x1000mm. It is not included with the control system such as Linsn, Novastar, Colorlight, etc. The production time is 22 days. - The modules can be quickly dismantled for servicing.